Like many people these days my career has taken a far from straight path. My first degree was in Electronic Engineering at Imperial College and I spent the first 10 years of my career in IT related roles. I gradually moved away from this as I found that people and organisations interested me more than technology. However I continue to maintain my interest in technology and how it can serve people. That is not to say that I am always an early adopter, sometimes I cling onto the old... my IT manager husband and I resisted a satnav for years preferring to navigate for each other (without marital arguments, I might add). I came across a great example this week of a piece of technology that I would happily be an early adopter for. If you come across examples innovative uses of technology like this that you think could be applied to young people living in Surrey do let me know. Even better post it on Communilab, our Community forum for all to see. Communilab is still in "beta" phase, but we are gradually increasing the number of people who can log in and post content. If you are keen to be an early adopter, we would love to hear from you. If you don't have a login and want one drop me a line. Last week I had another good meeting with a statutory body want to hear the concerns of young people to ensure that they are being addressed appropriately. It is widely known that this generation of young people are less interested in party politics than previous generations. What perhaps is less well-known is that they are more engaged in society and societal issues than their parents’ generation. Meanwhile, it feels to me like there is the will amongst lots of people within the statutory sector to get young people's voices listened to as part of the process of designing services. We are approached about once a month by statutory bodies and other organisations wanting to have young people’s opinions. Some may be tokenistic but I believe many are genuine. However there is often a mismatch between the ways in which young people want to talk and the ways in which statutory bodies want to hear. The traditional focus groups and surveys that have worked in the past will not necessarily appeal to the current multimedia, socially networked generation who have more choices of how to spend their time than ever before. One of the important aspects in all of this is making sure that young people are given some feedback after they’ve give their voice, so that they know what has happened as a result. This project is taking us a while to develop, rightfully so. I feel like I am on a treasure hunt, gradually gathering together clues on how we can make this happen in partnership with others. We are wondering about whether to create an interactive play or road show type event that can be taken to different youth settings in the county on, say, an annual basis, to collect young people’s opinions. The events would collect information on behalf of a variety of statutory bodies and other organisations. One of the criteria for the design of the events would be basing it on rigorous research methodologies, not just collecting a few sound bites. If you have heard of a similar thing elsewhere, do let me know. On Friday I will be meeting with Surrey County Councillors Clare Curran and Linda Kemeny to give them an update on Surrey Youth Focus. One of my top priorities is helping the youth third sector in Surrey to become sustainable in the light of on going funding cuts. This involves a variety of activities including opening doors for our member charities, envisaging very different ways of operating and forming new collaborations. A significant number of meetings in my diary during this period are contributing to this. In the snapshot period I am having three meetings with large companies – potential Community Champions for Communilab. This will give youth charities access to a variety of people within companies – HRs managers, CSR managers and many employees who are given a couple of days a year by the company to spend with a charity or community organisation of their choice. What a rich seam for charities to tap into…however I urge you to be creative and develop relationships slowly, building trust. Don’t dive in for the big ask on day one. My colleague Paul Mitchell (Transform Housing) and I are doing a piece of work to find ways to develop further trading opportunities for charities e.g. doing gardening or catering work, like the Leatherhead Youth Project model. Related to this we are having a meeting tomorrow with a large organisation’s purchasing department. Surrey County Council are interested in promoting collaboration between charities and companies…sound familiar? As you may have spotted by now, a subject dear to my heart with Communilab. I had an initial meeting on this with the lead project manager at Surrey CC. We will be looking at how we can collaborate with them on this… with Communilab we believe that we have part of the answer already up and running. The new CAMHS contract is an opportunity for a much better deal for young people with mental health issues and I strongly believe that the third sector has a key role to play in this. To this end I set up a meeting with some of my third sector colleagues and one of the potential bidders for the CAMHS contract. A very interesting meeting where we explored what we would like the brave new world to be....different routes to access and physical location (some young people would like services in school, others definitely would NOT), the young person being empowered to share information e.g. from counsellor to youth worker, educating the first line of youth workers/teachers to help nip problems in the bud, manage transitions better e.g. to senior school, and have a clear definition of what mental wellness is. I'm currently sitting on the youth commission being run by Surrey County Council to look into the future of use work in Surrey. As a part of this work I met with my colleague Chris Hickford at Eikon who is also on the commission. We want to think creatively from both a financial and delivery perspective to find ways to deliver quality youth work sustainability in Surrey. We will be looking for others to be involved with this. My colleague Su and I had a good meeting yesterday with the sociology research department at Surrey University looking at how we can develop our “Voice of Youth” work in a way that is empowering and interesting for young people whilst simultaneously being based on rigorous research methods. Other items in my diary during the snapshot two weeks…chairing a meeting of youth charity chief executives this Friday, attending the Children and Young People’s Board and the Surrey Nature Partnership board, meeting with my wonderful predecessor Mike Abbot for a cuppa, internal meetings with my chair and team, and then various responses that I owe funders/potential funders. Actually I feel quite tired reading all of this. Looks like I am doing a fair amount….hopefully from this you get a flavour of that I am working hard to ensure the future sustainability of the third sector over the coming years. P.S. I haven’t mentioned any of my private life during this period… organising a school entry in a swimming gala, captaining a hockey match, date with a nit comb, seeing Shaun the Sheep at the Cinema, taking the kids to a Chinese for the first time….9 year old was more up for it than the 4 year old. 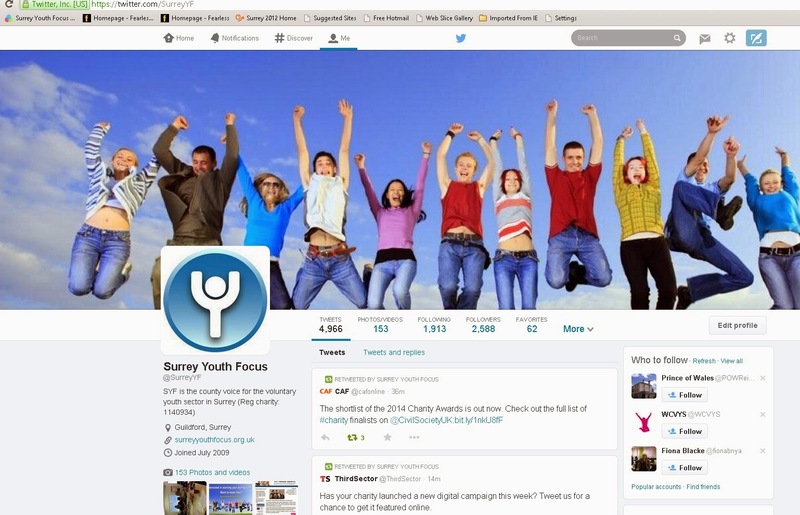 We had a lovely surprise last week – Surrey Youth Focus received not one but two awards at the Surrey Digital Awards. The surprise was particularly great because we were only shortlisted for one! We received silver in the best School, Education Or Charity Website website. The winners were World Wildlife Fund and our friends Oakleaf received bronze. Also among the shortlisted were our members Halow. This was followed by a special ‘Spirit of Surrey’ award which had not been announced prior to the event. The other people on our table said that our faces reflected our shock when our name was announced! This award is a huge testament to all of the hard work done by Karen with the wonderful support of Su, Kate and Linda on the website over the last five years. The content on the website is always kept fresh. One of the ways in which the team make my life easy is the seamless way that if one person is out of the office, work just gets magically done by someone else with no fuss…updating the website is a good example of this. This award is also a reflection of the decision to invest early in the technology taken by my predecessor Mike Abbott and the team before many charities were doing this and a reflection on Creativitea who designed the site and continue to support us. But no time to rest on our laurels, our work goes on. Two items about young people caught my eye this past week, one was far better publicised than the other. The sad deaths of several people in Wales due to some young drivers enjoying their new found freedoms with their drivers’ licences made front page headlines. Nothing new, unfortunately, it was ever thus, when I was a teenager, a lad down the road died when driving recklessly. What was less publicised was data released by the Office for National Statistics a few weeks ago which showed that binge drinking is down significantly among the young. Far from the youth of today being reckless and decadent, the survey described on the BBCs Inside Health radio 4 programme said that the number of young people admitting to binge drinking was down from 1 in 3 in 2005 to 1 in 5 in 2013. There have also been impressive drops in the numbers of 15 year olds smoking in the last 30 years, from 25% to 8%. It is our job to champion young people, so that the good news gets out to counter the negative stories that tend to dominate our media. Please spread the news! Apologies for the lack of blog for two weeks. The first was for a holiday – very important time devoted to my own kids (and husband! ), rather than the young people of Surrey in general. I then came back to a very busy but interesting week and had little time to catch up on email or write the blog… I’m sure you know the problem! Last week was a good example of the range of things I get involved within in this job….the most exciting was our beta test of Communilab carried out by our very supportive partner Barclays. We had nine very engaged Barclays employees aiming both to break the system and make suggestions for improvements. We have come away with lots of ideas and will be asking our developer to make some changes. We will be sharing Communilab with more and more of our partners…charities, Surrey County Council, Penningtons Manches solicitors, Exxon Mobil, Pfizer, Surrey Deputy Police and Crime Commissioner, etc… over the coming weeks and months. · Internal monthly Management and Finance meeting with my trustees. With respect to funding, a theme which keeps reoccurring is the old localism versus efficiency debate. Understandably funders often balk at the idea of breaking their funding pots down into small amounts because it is expensive to administer. They therefore give out larger pots. However, they are often keen to get smaller organisations, particularly charities, involved in delivery. They therefore want charities to form partnerships to bid for these funds. This does not, in my opinion, reduce the costs, it merely shifts them away from the commissioner into the delivery organisations. It costs to build and maintain high quality partnerships. And sometimes they go wrong, leaving one or more partners who have delivered admirably out of pocket or with a contractual or reputational problem on their hands. This emphasises the second issue with this model – the transfer of risk away from the funder to the delivery organisations. This is why the cost efficient approach of the large business suppliers (e.g. Serco) is often attractive to funders. I realise that this might be unpopular in some quarters (after all most of us charity CEOs and trustees enjoy our roles, don’t we? ), but I believe that in the tough funding regimes going forward, larger charities would flourish better and that some mergers are needed. My belief is not just based on theory, I have seen the huge difference that scaling up can make as a trustee of Groundwork in London over the last ten years. I first went onto the board of Groundwork Merton, which had a turnover of approximately £1m, but whose future was very uncertain. Over the period of five years, 7 Groundwork trusts merged to become Groundwork London with a turnover of over £10M. This required 7 boards to fall on their swords and a variety of suitable arrangements found for Executive Directors to manage the transition appropriately. Groundwork Merton might not have survived, Groundwork London is now flourishing and accessing a range of funding that would not have been open to it before. The great work is going on. There was a big debate (about three years long!) about how to maintain the local connections beyond merger. The proof has been in the pudding. I think we need to wake up and smell the coffee in Surrey…. mergers may be the best route to get our great work to flourish….